Economic activity in Brazil showed strong signs of strengthening at the start of 2013, according to the latest Economic Activity Index released by Brazil ‘s Central Bank Friday. Brazil’s economy grew at a slightly faster pace than expected in January, prompting some relief for Brazilian President Dilma Rousseff, who has spearheaded a number of initiatives to boost GDP. Economists warn, however, that the recovery could be offset by inflationary pressures. The index registered a 1.29 per cent increase from December to January, the biggest monthly rise since June 2008, when the index advanced 3.17 per cent. Compared with January of 2012, the index jumped 3.84 per cent, the central bank said. Last year, Brazil’s economy grew a scant 0.9 percent, according to official figures, much less than the government had projected. 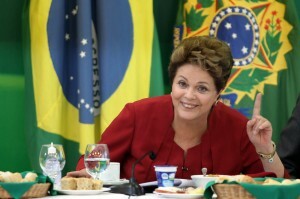 Brazil’s poor economic performance came despite a flurry of stimulus measures announced by Rousseff, including lowering the basic interest rate to a historic low of 7.25 per cent, expanding credit lines and cutting taxes to the private sector, among others. The Economic Activity Index seeks to predict how the country’s Gross Domestic Product (GDP) will fare, by incorporating data on the activity levels of the three main economic sectors: industry, trade and agriculture.